I’m a big fan of the new a16z podcast, which launched a few weeks ago and already put up seven great episodes. Last Thursday, they put up a particularly good one about Full Stack Startups, a term recently coined by Chris Dixon that I fully expect will get launched into mainstream usage before long. Read Chris’s post and/or listen to the podcast to get an idea of what they mean by a full stack approach; it’s like a company version of programming all the way from the back to the front end, or a bit like vertical integration for startups. Uber, for instance, doesn’t just provide an app for hailing a cab, it also pays the cab drivers. Nest made their own thermostats. At Backtrack, we’re trying to enter and disrupt a market that has remained nearly untouched by software: the rehab industry. Rehab seems like a prime target for innovation, especially by the Quantified Self movement (which I’ve talked about before and certainly will again). And we’ve seen some great innovation for specific complex situations like stroke recovery, from companies like Jintronix. Yet no one’s really made any headway towards fundamentally changing the way we recover from a back injury. We know from years of scientific research that recovery from back pain requires, essentially, a Quantified Self approach to recovery. But no one’s turned this into a successful product or service, even though it seems like low-hanging fruit. Maybe it’s because no one has tried a full stack approach yet. 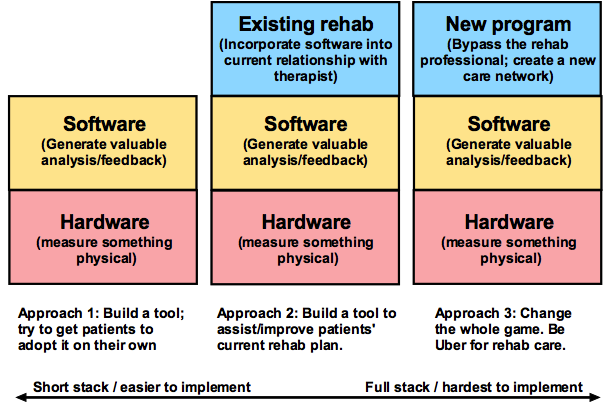 Consider some generic rehab tool with a hardware and software component that can help you with your recovery. (This is essentially what we’re developing Backtrack to be. But we can generalize for now.) Do you release it on its own as a consumer product, and hope users see its value / use it properly? Do you muster a full-stack assault on the status quo, and try to be the Uber of rehab care? Or is there some middle ground where you can gain some of the advantages of a full-stack approach, but not have to compete with the entire existing ecosystem? Given the fact that rehab remains an essentially software-free business, I think there are grounds for suspicion that short-stack approaches are likely to fail. (Mostly because if that notion were false, something relevant would exist by now.) But I suspect that directly competing with rehab professionals (the Uber approach) would be a fatal mistake, and wouldn’t actually result in better care for anybody. Maybe the right approach is to ask the question: what are the reasons why a physiotherapist wouldn’t use a standalone consumer product on a patient?¹ What elements of the experience are missing? Is there a way we could improve the experience in a way that engages, rather than alienates, the caretakers who currently treat our back injuries? What should a full-stack rehab company look like? Does it look like Glooko, if they made their own glucose monitors? Does it look like Nike Fuel, a specific activity-tracking component of a much larger company/ecosystem? We’ll see. 1. One reason is the regulatory environment, which will certainly influence buying decisions in any sort of health care setting. But as Compliance-as-a-Service apps like TrueVault becomes more readily accessible, I imagine that regulations will eventually become a less intimidating obstacle.